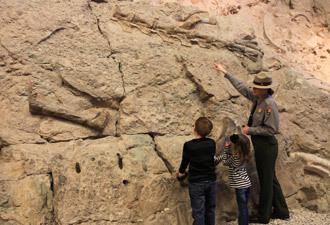 Homepage photo: A family views the allosaurus and Jurassic mural on display in the Quarry Exhibit Hall. The wall of bones is a scientific wonder. Paleontologist Earl Douglass began excavation here in 1909. Through the years, researchers identified and removed ten different types of dinosaurs from the quarry. Allosaurus, Diplodocus, and Stegosaurus, names that many kids easily say, are among those discovered, along with other animals such as crocodiles, turtles, and clams. Museums around the world display dinosaurs that were discovered here. To me, these fossils are more than museum objects. These remains of once-living animals provide a glimpse of our planet, 149 million years ago. They are young and old, predator and prey. They mated, raised their young, defended territories, fought for survival, and eventually died. Encased in rock, they reveal the ever-changing story of life. Fossils are only part of the story at Dinosaur National Monument. The geologic processes that preserved and exposed the fossils also created a dramatic landscape where upturned layers of rock reach for the sky and gentle slopes plummet over cliffs into canyons filled with raging rivers. 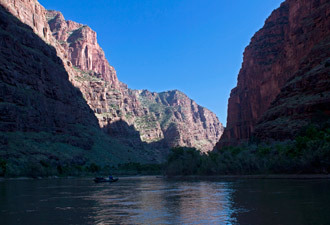 The Green River enters the canyons through the Gates of Lodore. John Wesley Powell named this and other features when he first navigated these waters and mapped the territory. Downstream at Echo Park, the Yampa River, the last naturally flowing river in the Colorado River system, joins the Green. Plans surfaced in the 1950s to drown these canyons behinds dams, but conservationists fought them. Their efforts allow us to experience the adventure of rafting Dinosaur's rivers. Though Dinosaur might seem like a remote, harsh place, traces exist of the many people who have lived here. Archeological sites reveal early human settlement beginning nearly 7,000 years ago. 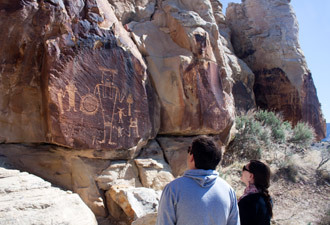 Petroglyphs and pictographs depict the work of the Fremont Culture, who inhabited the area around 1,000 years ago. Generations of the Ute tribe hunted deer and elk along the rivers and ridges. More recently, homesteaders, ranchers, and even outlaws called this place home. Dinosaur is also home for many modern-day plants and animals. The rivers, the range of elevations, and the meeting of the Colorado Plateau and the Rocky Mountains support a diversity of life. Prairie dogs and peregrine falcons, mule deer and moose, black bears and bighorn sheep, coyotes and cougars are all residents. When you visit Dinosaur, you will no doubt marvel at the fossils, but be prepared to discover even more. Take a hike on the Sound of Silence trail, a scenic drive on the Harpers Corner Road, or sit underneath a shade tree beside Josie's homestead. Perhaps you'll find yourself saying “wow” over and over again.